Website is in German and has a link for Italian. 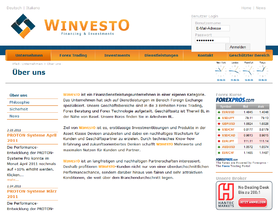 I wish to report a heavy scam forex company, the Winvesto - Financing & Investments offers Managed Accounts with max risk per trade and present a lot of statements with high profits and low losses. The CEO Mr Ambrogio Troia is also member of a regulatory authority in Switzerland and i have trust him to invest 20000 CHF after few months and tousands of trades i have 5000 CHF. On the website ([url=http://www.winvesto.ch]Home: winvesto - Fremdwährungshandel und automatisierte Handelssysteme[/url]) you can see: Max leverage 0,1 - 0,5 but i have more than 3 lots open positions!? Max risk per transaction 0.25% but i lost 2700CHF with a 0.30 trade!? I have a balance of 20706.35 CHF with a floating of -15508.21 CHF. Please beware of this scam company and safe your money.